TIFF 2013 on March 13th-17th will draw together manufacturers, entrepreneur, designers and operators for a five day event. TIFF 2013 will be an important trade forum for furniture manufacturers, entrepreneurs, designers and operators of related businesses to engage in direct discussions and negotiations in order to establish partnerships for the future. The Department of International Trade Promotion (DITP), the Ministry of Commerce, together with, the Thai Furniture Industry Club The Federation of Thai Industries and the Thai Furniture Industries Association (TFA) have all joined forces to ensure that the 17th Thailand International Furniture Fair (TIFF) in 2013 will be the grandest, most impressive of its kind ever staged in Thailand. TIFF 2013 will be held on March 13th-17th, 2013, under the concept of “Inspire inside out”. International furniture professionals and anybody interested in keeping up-to-date with the latest innovations the world of furniture are encouraged to visit this event where they can be inspired, establish or strengthen business networks, as well as, discover solutions to virtually all your furniture demands at this awe-inspiring event. 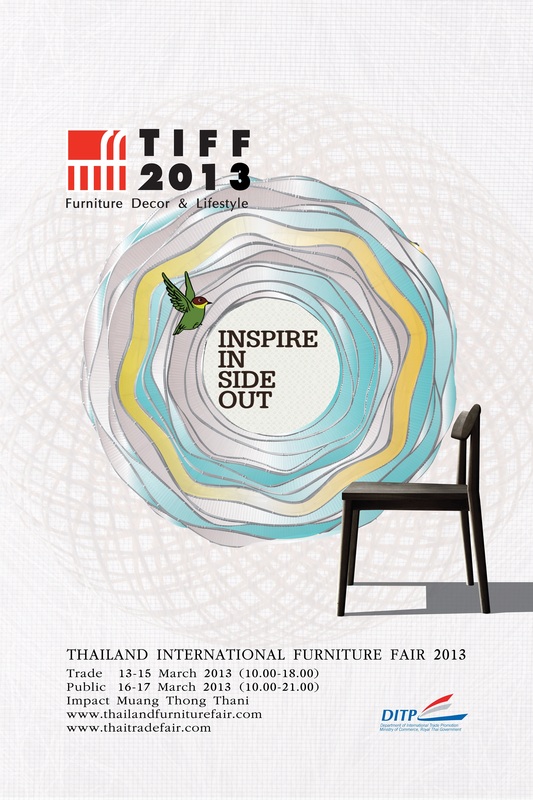 “TIFF 2013 aspires to be Thailand’s most comprehensive one-stop showcase of the very best furniture innovations the country has to offer, with the largest numbers of both exhibitors and visitors from around the world. Moreover, what sets this event apart from other similar events is the emphasis on the distinctive design qualities of exhibited items. TIFF 2013 promises to be a worthwhile visit for businesspeople the world over who are interested in the latest developments in the Thai furniture industry which has been greatly developed in many ways including unique and more advanced designs using a winning combination of mixed materials. TIFF 2013 includes a lineup of exhibitors from Malaysia, Indonesia, Cambodia, Laos and Myanmar, as well as, those from Europe. “The TIFF 2012 event was indeed a great success with more than 24,000 visitors attending the event”, noted Mrs. Nuntawan.